Exhibits and Artists Meet & Greet • 9 a.m. – 4 p.m.
From 1930-1945, President Franklin Roosevelt conducted 30 speeches that were broadcast over the radio, referred to as “Fireside Chats”, as a way to communicate with the American people. Using objects from Culture & Heritage Museums’ permanent collection, including a local newspaper with a headline about the attack on Pearl Harbor, the display sets the scene of a 1940s living room in York County with a fireside chat playing through the radio. An exhibition of original works of art commissioned by Culture & Heritage Museums tells the story of the Southern Campaign of the American Revolution. Meet & Greet the artists: Kelly Pauley, a historical portrait painter and Dan Nance, a painter of historical battlefield drama. Artists’ prints available for purchase. Michael Scoggins, Culture & Heritage Museums’ historian & author, will be available for book signings and inquiries regarding his research on the American Revolution in the Carolina Backcountry. 10 a.m. Joseph C. Mester, Culture & Heritage Museums’ historic preservation manager, talks about the architectural and building traditions of the Carolina Piedmont from its settlement in the mid-eighteenth century to the eve of the American Civil War. 2 p.m. Nancy Sambets, Culture & Heritage Museums’ director of archives, highlights the years when the Barnett Bros. Circus quarters were in York. 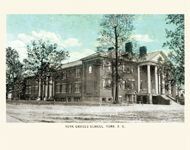 York Historic District Walking Tours • 3 - 5 p.m.
Yorkville Historical Society offers self-guided & guided tours of the York Historic District, listed on the National Register of Historic Places. Meet in the McCelvey lobby.